Winter Read 2016: Read A Latte will kick off during February and March! Join us in February to be included in drawings to win one of five Dr. Seuss books donated by our local General Federated Woman’s Club of Heyworth (GFWC). For every book, audiobook, or magazine checked out in February a ticket will be given for a drawing of the books. You may choose the book you want to be entered to win. The drawing will be held on March 2, Dr. Seuss’ birthday and National Read Across America Day. Only one book may be won per person. Family Reading Night returns in February on Thursdays at 6:15 p.m. throughout the month until March 17. Mark your calendars and bundle the kids for a great time of stories, music, and crafts. Also in February our Third Annual “Blind Date with a Book” event will be held. We have selected award-winning, highly recommended favorite reads, and some classics and wrapped them in paper. We will also be adding young adult (YA) materials. Come in and choose a wrapped up book as your “blind date”. Give it a read. Then fill out our “Rate Your Date” book mark and return it with the book. We aren’t arranging marriages, and not a dime has to be spent! Just give a new book a try – you never know which new favorite author or genre you might fall in love with. All the “Rate Your Date” book marks returned will go in a drawing for one of two Heyworth Library Tote Bags. The last day to grab a Blind Date will be on March 31, but we won’t draw a winner until April 22 to allow those readers three weeks to get their dates read. Don’t forget to checkout our Book Sale area. We are brimming with great reads, music, audiobooks, Disney VHS, and other DVD movies. All for great prices that help support the library in purchasing the extras not in our budget. A new year and new digital toys may have been gifted to you this holiday season. If your digital device uses apps from the Google Play or iTunes stores it will also work with our library apps. Visit our website at heyworthlibrary.com for tutorial help sheets with the various e-readers using Overdrive, Axis 360, Freegal, or BookMyne. Or call to schedule a face to face tutorial (473-2313) on using the library’s apps. Movies @ Your Library – Special time on January 15 – 1:00 p.m.
We are thrilled to offer crafters a space to create and socialize! This group is very willing to teach anyone who would like to learn to knit or crochet. We have yarn, instructions for beginning projects, and needles to get you started on a new hobby. If you want to learn how to knit or crochet you must sign up to attend so our group can have all you need ready for the evening. If you are a knitter or a crafter looking to socialize with others in our area, just show up as your schedule allows. Available to anyone 4th grade and up. This group also supports the local Project Linus chapter with squares and blankets. “History in Your Own Backyard” Winter Series by the Heyworth History Club, every 4th Tuesday of the month. A program on local history will be given in the library Community Room, 6 p.m. – 8 p.m. RSVP by January 18. Heyworth Businesses Then and Now, in the Community Room with a short presentation on the collected histories and pictures the Heyworth History Club have gathered to date. Join us for this informative presentation, but more importantly bring items to share to broaden our collective knowledge of local business history. Do you have a ruler, baking mitt, or magnets in your possession of previous area businesses? Or pictures of area businesses? These are the items of interest we are looking to document. Give-away trinkets with the business names are items we are looking to take pictures of to document this part of our local history. Afterschool snack, Lego games, and creative building. Sign up at the library. 1st grade – 8th grade. Heyworth History Club, 4th Wednesday mornings at 10:30 a.m.
Family Story Time, Thursdays (All of Feb – March 17) at 6:15 p.m.
Join us at the library each Thursday evening for a family story time. Our story and activities will be geared for Pre-K to 1st grade, but the whole family is encouraged to join us for an enjoyable 45 minutes of family FUN! Blind Date with a Book: Come in and choose a wrapped up book as your “blind date”. Give it a read, then fill out our “Rate Your Date” book mark and return it with the book. We aren’t arranging marriages, and not a dime has to be spent! Celebrate Dr. Seuss’s Birthday: Join us this February to be included in drawings to win one of five Dr. Seuss books donated by our local General Federated Woman’s Club of Heyworth (GFWC). For every book, audiobook, or magazine checked out in February, a ticket will be given for a drawing of the books. And this winter we are adding E-Books checked out through OverDrive using your Heyworth Public Library card. Just ask for an eBook entry slip when you visit the library. You may choose the book you want to be entered to win. The drawing will be held on March 2, Dr. Seuss’ birthday. 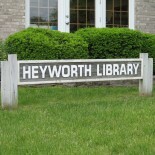 This entry was posted on January 13, 2016 by Heyworth Public Library District.